Did you know there is an alternative to full and partial dentures? Wearing dentures can pose many problems — from improper fit, clicking and noises when eating, unnatural looking and more. At Day Dental we are pleased to offer Innisfail an alternative to conventional dentures! Innisfail Implant Supported Dentures are Your Alternative to Dentures! Dental implants can now be used to support full dentures to create better support for the denture. 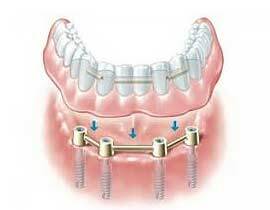 Using dental implants, the denture “clips” into the dental implants, providing support that is second to none! Please be aware that the cost of an implant supported dentures is greater than that for standard dentures, but there is an added benefit in that the implant supported solutions feel more natural, are stronger and more stable and will help maintain your jaw bone over time. Unfortunately, not everyone is a good candidate for an implant supported bridge or implant supported denture, if you would like to explore the potential for implants supported denture solutions, we would be happy to discuss this with you during your denture consultation. Dental implants are made from surgical-grade materials and acts to replace the missing root of your tooth. They are surgically placed into the jawbone, and after a short period of healing, your dental implant is fitted with a ceramic dental crown or bridge to complete the restoration. We also recommend Dental implants for patients with dentures in order to maximize the fit and comfort of the denture when problems such as inadequate bone levels are or irregular bone shape interfere with the function of the denture. Patients that experience pain and irritation to their gum tissues, and resort to using denture adhesives are great candidates for implant supported dentures. The success rate for dental implant treatment is very high. We consider Dental implants as a permanent restoration. Unlike wearing a denture or partial denture that must be removed every night or worry about eating certain foods that may cause the denture to click or slip, dental implants are the closest restoration to your natural tooth structure! Ideal candidates for dental implant supported dentures have good overall health and practice routine oral hygiene practices. Adequate bone levels in your jaw are also required to support the dental implant, and healthy gum tissues that are free of gum disease is very important, in order for your dental implant treatment to be successful.